Established in 2003, Hir TV was Hungary’s first television news channel and continues to be its leading news broadcaster. A recent technical upgrade has seen a Yamaha CL series system installed, delivering exceptional flexibility and cost-effectiveness. As well as regular news bulletins, Hir TV broadcasts investigative reports, political discussions, talk show Buké, phone-in programme Vonalban and a number of BBC programmes with Hungarian translation. Last year the company built a second studio and control room and, with the existing technical infrastructure approaching 10 years old, the opportunity was taken to undertake a comprehensive upgrade. "We worked closely with Hir TV to redesign all the core technical systems," says Máté Kovács, system engineer at Studiotech Hungary Ltd, who designed and installed the upgrade. "All the video devices for both studios were available on a central router, so each studio’s video could be managed from each control room. However, that was not the case for audio, which used an analogue system. "We felt that a Dante audio network would provide the flexibility and increased audio quality that was needed. Hir TV already had a Yamaha DME64N digital mixing engine for incoming line co-ordination and managing intercom lines, which had worked perfectly for many years, so it was obvious to move forward with a unified Yamaha audio system." The new equipment includes CL5 and CL3 digital consoles, Rio3224-D and Rio1608-D i/o units, plus the existing DME64N fitted with a Dante MY16-AUD interface card. "The core of the system is the Rio3224-D, which is basically the bridge between the audio and video world as it handles the i/o signals of all the audio embedders/de-embedders and video servers," says Máté. "We integrated the DME64N with the Dante network using the MY16-AUD interface - this allows access to all the incoming and outgoing lines, as well as connecting with the intercom system." The CL5 was installed in the main control room alongside the Rio1608-D, which gives wireless microphones and audio playback devices access to the network. 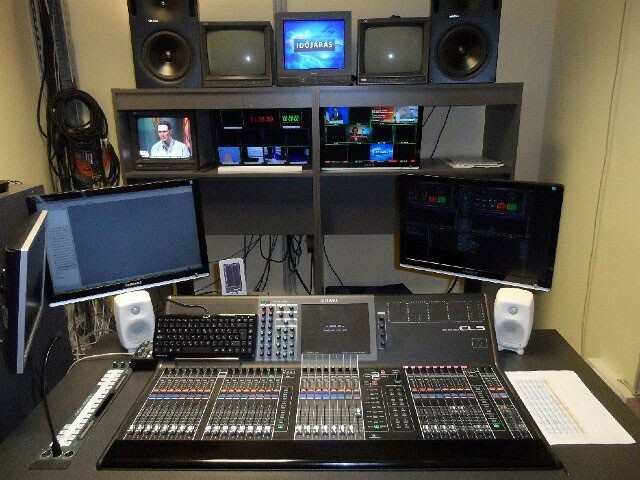 The CL3 was installed in the second control room, with all audio monitoring fed from the local i/os of the consoles. "The CL mixers and Rio units provide all the necessary functions in an extremely cost-efficient system. It is very powerful but also very straightforward, because we didn’t have to install a lot of different equipment to meet the client’s needs," says Máté. "All the engineering and audio staff at Hir TV have found it easy to use and agree that it is the best and most reliable solution. Since the initial installation the system has already had an Ri8 added, used as a dedicated input for microphones. "It was added very quickly and shows how simple it is to extend. This ease of expansion ensures that the Yamaha system will serve their needs for a long time," Máté concludes.